In the 1970s, St. Lucia Parrots, which live in the Caribbean, needed help. People were clearing their forest habitat for agriculture, catching and keeping the birds as pets, and killing them for food – until there were only about 150 left. But then the island’s forestry department, and an advisor named Paul Butler, began saving the parrots. The key, says Butler, was to build local pride in a species that’s found nowhere else on earth. Their efforts paid off: Today, there are some 1,500 St. Lucia Parrots! 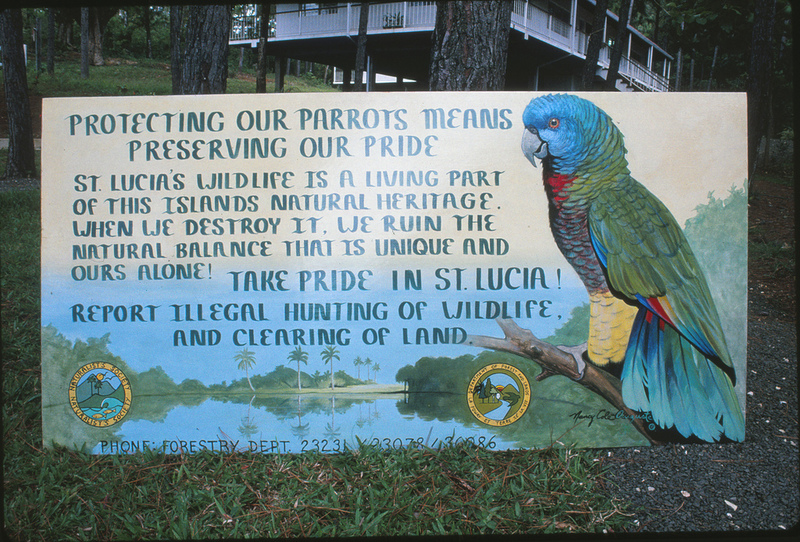 In the 1970s, in the Caribbean, St. Lucia Parrots needed help. People were clearing their forest habitat for agriculture, catching and keeping the birds as pets, killing them for food – until there were only about 150 left. But then the island’s forestry department, and an advisor named Paul Butler, began saving the parrots. The penalty for killing them was raised; tourists were invited on rainforest walks to see the birds; and protected areas were set aside. The key, though, says Butler, was to build local pride in a species that’s found nowhere else on earth. Today Paul Butler is the Global Vice President for Rare – an international organization working with local partners so that both people and nature thrive. Musical selection from "Bongo Man" played by Wrangler. The CD is called Calypso Awakening and the release is from 2000 on Smithsonian Folkways recordings. Bird sounds provided by The Macaulay Library of Natural Sounds at the Cornell Lab of Ornithology, Ithaca, New York. Calls of St. Lucia Parrots  recorded by L. Macaulay. Ambient drawn from Gordon Hempton’s Essentials # 38, tropical forest -- QuietPlanet.com.